This area is notable for outcroppings of micro-gabbro so we had hoped to see some good base-rich-dependent plants. Unfortunately, we were just too early as the weather still hadn't caught up, but we did see Wheatears, Swallows and House Martins - the first ones I had seen this year - so spring must be almost here! 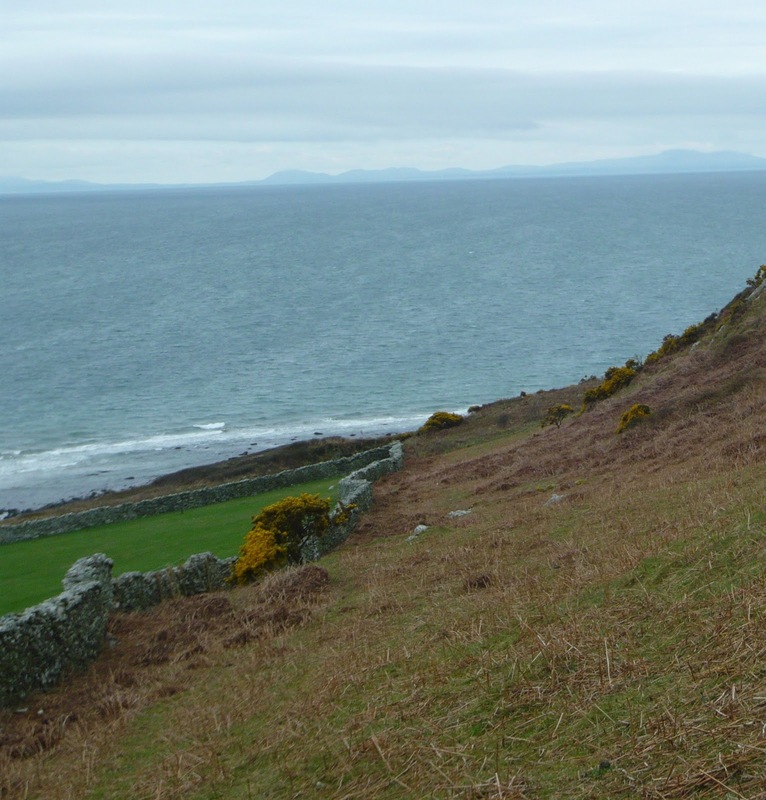 We started off from Llech Llwyd, where Elwyn Roberts, the farmer, had let us park, and walked down across sheep-grazed, improved pasture to a boggy area near the shore of the curious Broadwater, the almost land-locked estuary of the River Dysynni. There were so many brackish-loving plants to be seen but without flowers so that even with the indispensible 'Poland' to aid identification, we soon felt we could use our time better and decided to go on to the quarry. 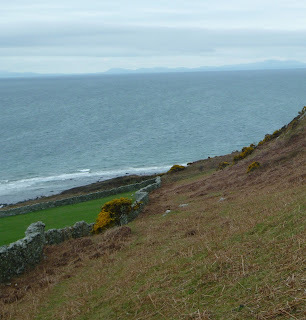 Walking along the lane it seemed we had moved on in time with the hedgebanks full of the first Stitchwort, Stellaria holostea, the first Dog Violets, Viola riviniana and the hillsides ablaze with early-flowering Gorse, Ulex europaeus. Viola riviniana - Spring is on the way! Smiling in spite of the weather! 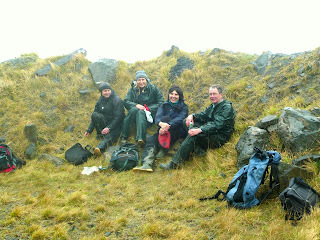 We reached the quarry where we had a damp lunch with a low-lying grey mist. Roadstone is still being extracted here and we found some curious plants in the settling tanks, including a Stonewort, Chara sp. [one of those curious 'honorary' vascular plants], Typha latifolia, Bulrush, and a great swathe of Equisetum telmateia Great Horsetail. Some people were almost ready to give up by then but the tougher souls said that we should try the other dolerite outcrop at Foel Fendigaid a couple of miles further north where we found more interest in a small flush and further on a grassy hillside which posed us a couple of challenges. We had been discussing the possibility of finding Upright Chickweed. Moenchia erecta [which has been recorded here in the past], when sharp-eyed Heather L found a different plant of the Caryophyllaceae, which we eventually decided was a Spergularia, tentatively identifying it as S media mainly on the characters of the scarious stipules. Later, Annie found some strange woody stems over two metres long crawling about in the dead bracken, which stumped us for a while, until we decided they were the over-wintering stems of Solanum dulcamara, Bittersweet, only just beginning to leaf, and not enough to make identification easy! The joy of our group outings are the many skills that members bring along. Expertise in bryology, lichens, and in many classes of invertebrates are just a few of their subjects. I feel so lucky to have these opportunities. I have passed the burrow exits of the Minotaur Beetle Typhaeus typhaeus so many times without connecting them with this fellow. He lives on rabbit and sheep dung, but lets the female do most of the work of excavating shafts underground where the eggs are laid.